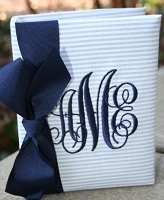 Need a great monogrammed graduation gift for a special girl or guy graduating this year? The Pink Giraffe offers a large selection of high quality personalized gifts to choose from. She will love our acrylic initial necklaces in a large selection of colors. Our personalized sterling silver necklace is a fabulous option that she will cherish for years to come. Our custom monogrammed shower wraps are perfect for the dorms. She will be able to use it in the summertime at the pool and then in the fall and winter after a shower. Embroidered with a choice of name or monogram in any thread color you desire. Choose to match to school colors for a fun and unique personalized gift for graduation. Boys will love our engraved gifts for men including a monogrammed leather wallet stamped with his initials, or a leather dopp kit that is perfect for taking on the go. Engraved silver cuff links for men are a classic staple and will be a cherished gift. If his travels take him places, a personalized duffle bag is a great option. Embroidered with a name or letters it can never get lost! The Pink Giraffe specializes in bringing our customers the very best in monogrammed gifts for every occasion. Classically personalized for your classic lifestyle!